Coldcut: Time Lordin' it up. This year's BBC Electric Proms season has seen the likes of Oasis, Razorlight and The Last Shadow Puppets take to the stage, but rock isn't all that's been on the agenda. 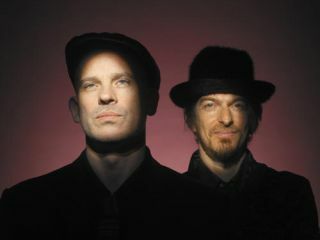 On Saturday, electronica legends Coldcut played a DJ set, with the highlight being a live remix of the Doctor Who theme. The gig celebrated the legacy of the BBC's Radiophonic Workshop - the legendary unit that pioneered a variety of sound design techniques. It was here that the original Doctor Who theme was created by Delia Derbyshire, whose influence on the development of electronic music can't be overstated. Coldcut's set featured "live sampling" of original Radiophonic Workshop gear, and can be viewed on the BBC Electric Proms website. Alternatively, check out this clip of their Doctor Who rendition on YouTube.